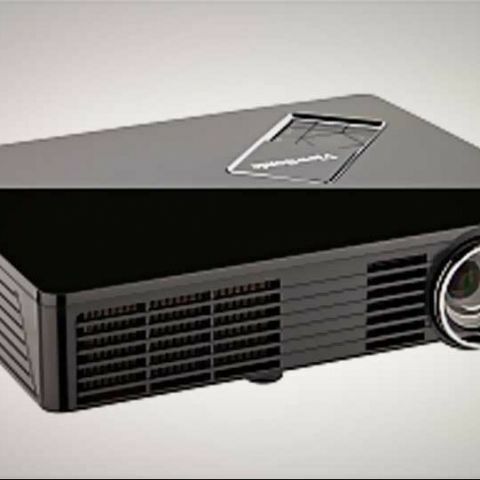 Viewsonic added two new LED projectors to its family of products, the PLED-W200 and PLED-W500. The unique selling point of these new Viewsonic LED projectors are that they’re ultraportable and energy-efficient. Featuring diminutive form factors and 30,000-hour, long-life LED lamps, the PLED-W500 and PLED-W200 projectors support 3D technology with 120Hz frame rates for viewing 3D visuals, and can project between 33 to 40-inch screens from a 1 metre distance. These new Viewsonic PLED-W200, PLED-W500 LED projectors also feature versatile USB connectivity, while the built-in Microsoft Office/PDF viewer and SD/SDHC card reader can display documents and play multimedia files without needing a PC. The projectors PLED-W500 and PLED-W200 are priced at Rs 61,000 and Rs 44,000. The PLED-W500 sports a stylish new look. The piano-black mirrored surface and geometric inset buttons make the projector modern, sleek and elegant, ideal for business presentations and multimedia entertainment, according to Viewsonic. With dimensions of 214 x 164 x 42 mm, the PLED-W500 is compact and weighs only 1.18 kg. 500 ANSI lumens, superior in the LED pocket projector category, provide 20,000 hours of brightness for energy and cost savings. The 1.4:1 short throw ratio projects a 33-inch screen from a 1 metre distance with high native WXGA resolution. 2GB of onboard memory allows you to store documents and multimedia files, enhancing presentation efficiency. With HDMI 1.3 support, simply connect the PLED-W500 with a PC, tablet or other device to enjoy a widescreen gaming or home theater experience. You can also view smooth 3D video with a 120Hz refresh rate using active shutter glasses. PLED-W500 has versatile USB connectivity, built-in Microsoft Office/PDF viewer and SD/SDHC card reader which can display documents and play multimedia files without needing a PC. Viewsonic. Its LED light source with 250 ANSI lumens lasts 30,000 hours while producing brilliant color. With a built-in 32 GB SD/SDHC card reader, Microsoft Office/PDF viewer and dual integrated 2W speakers, display Word, Excel, PowerPoint, PDF and other multimedia files without needing a PC. The PLED-W200 also features 1.16:1 short throw ratio that can project a 40” screen from a 1 m distance with high native WXGA resolution.